The order page probably has the most raw HTML code. This page defines all the fields pertaining to customer information, as well as a list of items to be ordered. Fortunately, MiniVend maintains the item list for you, and you can extract it by using a few simple MiniVend tags. You define the customer input fields, which are contained in your order reports. You can maintain persistent values for these fields by using the [value] tag. 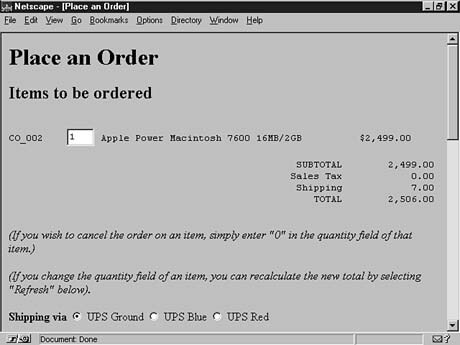 This means that when a user fills out the order form page, leaves it to find another item, and then comes back to the order page, all the information he or she originally entered is not lost. The order page code is shown in Listing 13.5. Listing 13.5. The order page. new total by selecting "Refresh" below). * Name            <input type="text" name="name"
Company Name    <input type="text" name="company"
Email Address   <input type="text" name="email"
* Billing address <input type="text" name="address"
* City            <input type="text" name="city"
* State/Province  <input type="text" name="state"
* Zip/Postal Code <input type="text" name="zip"
* Country         <input type="text" name="country"
Daytime Phone   <input type="text" name="phone_day"
Evening Phone   <input type="text" name="phone_night"
Zip/Postal Code  <input type="text" name="s_zip"
As you can see, this page contains the most information of all the MiniVend pages. The page starts with a list of items that are being ordered. This list is specified using the [item-list], which is similar to the [search-list] tag you saw earlier. The difference is that this list contains those items the customer has placed in his or her shopping cart rather than a list obtained from searching the database. The semantics of how this tag works are the same. Within the [item-list], you again see the [item-code], [item-description], and [item-price] tags. One new tag contained within this list is [item-quantity], which is a user-specified value. To cancel the order of an item, the user must enter a zero in this field as the informational text describes. You might be curious about the [row] and [col] tags. They are general formatting tags provided by MiniVend for displaying a table look within a preformatted text <PRE> section of your HTML. The value specified in the [row] tag tells the number of total columns in the row. Each column can then be given a certain size and alignment. For more detailed information, refer to the MiniVend documentation. Of more importance are the [subtotal], [salestax], [shipping], and [total-cost] tags. These tags demonstrate the power and simplicity of MiniVend. A large part of the MiniVend package deals with the dynamic creation of HTML based on your product database; the other, perhaps even more useful, part deals with maintaining the running subtotals, tax, and shipping costs. The subtotal is a fairly easy one to figure out by simply adding up the item prices while taking quantity into account. The tax is figured using a special database file called salestax.asc. Tax percentage is looked up using the state or optionally the zip code. A default percentage, which is normally 0, also is supplied. You can even designate certain items to be tax exempt by specifying a NonTaxableField in your minivend.cfg file and setting that field value to true for the tax-exempt item. code: A unique identifier for the shipping method. criteria: The criteria for shipping charge (for example, weight, quantity, or country). This field is for information only; it is not used by MiniVend for any calculations. minimum: The low bound of quantity or weight to which this entry applies. maximum: The high bound of quantity or weight to which this entry applies. cost: The total shipping cost (specified as a formula if it begins with "f" or as a multiplier if it begins with "x"). The customer chooses the shipping method by using the radio buttons listed in this example under Shipping Via. You can specify a default shipping by using the DefaultShipping variable in the minivend.cfg file. The [total-cost] is then calculated by adding up all these values. Figure 13.6 shows the section of the form containing a list of items that have been ordered. Figure 13.6. The ordered items part of the order form. 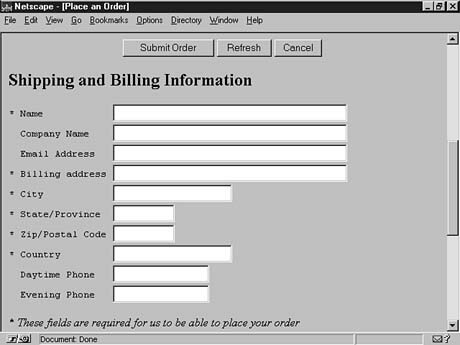 The remaining HTML in this example is simply the order form for gathering information from the customer. The only MiniVend tag used within this text is the [value] tag, which was described previously. This form is contained within a preformatted text <PRE> section for better alignment. Figure 13.7 shows this form as it appears in your Web browser. Again, you can include as many fields as you find necessary. MiniVend imposes no restrictions on the kind of data you can request from your customers. Figure 13.7. The customer information part of the order form.